We at Dieci Ltd strive to achieve the highest standards with our innovative & cost effective equipment. 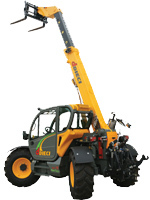 Dieci Ltd is committed to customer service sales and back up and is fast becoming the number one distributor of Telescopic Handlers in the UK and Ireland. We have dedicated sales personnel and a focused team of highly trained spare parts coordinators and highly experienced service technicians. Here at Dieci Ltd we stock thousands of genuine manufacturered parts from a basic air filter to complex engine transmision and axel spares. We are availble to ship parts worldwide and strive to maintain one of the best national parts services. Our team at Dieci Ltd have a very broad knowledge of all Dieci product and parts which helps us excelerate a great service and responce time to all customer enquiries. Check out this amazing new Dieci Agri Tech model which will change farming! This models amazing new features include precision electronics, outstanding performance with cutting edge technology and unmatched comfort.